Gargoyles are decoration for drainage. Gothic churches channeled water away from their walls to prevent erosion. The spout often emptied through the mouth of a sculpture. 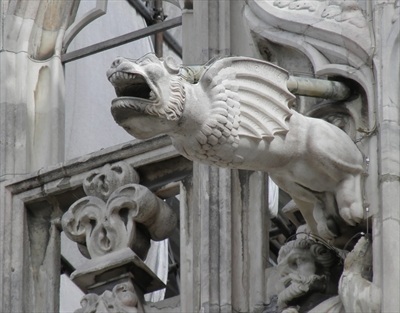 These spouts are called gargoyles, from an old French word gargouille meaning “throat” (it is related to the English words “gargling” and “gurgling”). Other forms of grotesque sculpture used to decorate churches are commonly referred to as “gargoyles” but, strictly speaking, they are not, because they have no practical function. Photo licensed from The 3D Studio. Next PostWhy did we do this? “Other forms of grotesque sculpture used to decorate churches are commonly referred to as “gargoyles” but, strictly speaking, they are not, because they have no practical function.” I think that they may be called grotesques. I once heard there were also a sign of monsters / daemons not being able to go inside temples. I think they might be related to apotropaics symbols, like Gorgons on Greek temples that serve to turn away evil entities from places of worship or houses or whatever.